Analysis: Military parade a political tug of war? Loyalty, duty, respect, honor, integrity, personal courage, and selfless service. Those are the seven core values every U.S. Army recruit is taught in basic training. Selfless service is defined as doing your duty “without thought of recognition or gain.” It is why so many members of the military I have met over decades of covering conflict find the idea of a massive parade in their honor highly uncomfortable. “It is not who we are," said a decorated veteran. President Donald Trump and French President Emmanuel Macron attend the traditional Bastille day military parade on the Champs-Elysees, July 14, 2017, in Paris. 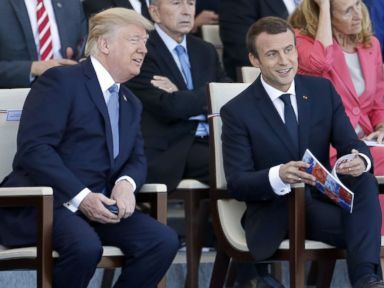 After seeing France’s Bastille Day parade in July, President Donald Trump said “It was one of the greatest parades I’ve ever seen” referring to the annual parade which features tanks rolling down the Champs-Elysees, formations of fighter jets and more than 8,000 soldiers. “We’re going to have to try and top it,” Trump added. And that seems to be what he is now doing, tasking the Pentagon to come up with a plan. France’s parade has been held since 1880, commemorating the July 14 Bastille Day national holiday, which marks the day in 1789 when about a thousand Parisians stormed the Bastille prison to free political dissidents. This incident became a flashpoint for revolution in France. By World War I, the parade had been moved to Paris’ famous boulevard, with a string of French presidents reviewing the passing troops over the decades. Soldiers march across Kim Il Sung Square during a military parade in Pyongyang, North Korea to celebrate the 105th birth anniversary of Kim Il Sung, April 15, 2017. 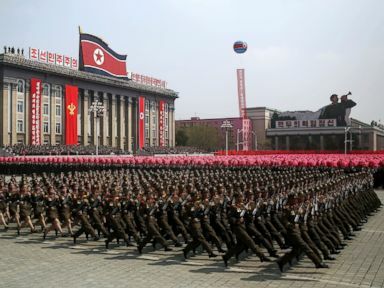 But aside from that historic parade, what most comes to mind these days when you think of displays of military might, is authoritarian regimes. Think of Russian troops under Vladimir Putin’s review in Moscow's Red Square. Think of missiles wheeling past Kim Jung Un in the streets of Pyongyang. When you are the U.S.A., with the biggest most powerful military on earth, you don’t need to roll your tanks down Pennsylvania Avenue to show the power. Of course, smaller parades to celebrate the military and veterans are not uncommon across the country. From New York City’s Veterans Day Parade, to small town Memorial Day parades and picnics, Americans seek to honor the sacrifice of our nation’s heroes. Every year, Washington, D.C. hosts wreath-laying ceremonies at Arlington National Cemetery and at the Vietnam Veterans Memorial, as well as a National Memorial Day Parade. And we have had our share of “victory” parades, including the one held after the 1991 Gulf War. Today, our troops are still at war after more than 16 years in Afghanistan and 15 years in Iraq. American forces are currently deployed to more than 150 countries across the globe. And our equipment and our troops are showing the strain. Readiness remains a serious issue for the U.S. military. “Let me be clear," Secretary Mattis said to Congress in January. “As hard as the last 16 years have been on our military, no enemy in the field has done more to harm the readiness of the U.S. military than the combined impact of the Budget Control Act's defense spending cuts, worsened … by us operating, nine of the last 10 years, under continuing resolutions, wasting copious amounts of precious taxpayer dollars." Perhaps the best way to honor our service members’ sacrifice is not with a parade, but by pressing Congress to pass a long-term defense budget that allows for modernization, more training and improves readiness. None of this is to say that our servicemembers don’t deserve more attention for their sacrifice and dedication. I have been a loud voice over decades of covering war and conflict in urging Americans to do more to respect and honor service. But this is not the Vietnam generation. This country loves its veterans. A recent Gallup poll shows they are the most trusted institution in the country. But a rumbling, roaring parade down the streets of Washington may not be the best way to show our respect, and unnecessarily places the military in the middle of yet another political tug of war. Martha Raddatz is ABC News' Chief Global Affairs Correspondent.